Wall Decor Ideas : Style that boring wall above your bed! Same life, same routine and the same bedroom every day… It’s always tiring to the see the empty wall above your bed, your favorite spot on the earth. It’s about time we fill in there with unique and inexpensive wall decor. Don’t you think it’s time to change your lifestyle? Let’s start with your bedroom. A classic bedroom wall with framed photographs. Do you take pictures as memories of good times? And every time you’ve to open your laptop to see it, is it then even worth it? Instead, print out a dozen of them and frame them to hang up above your bed. The frames are better self-made in different colours or you can purchase them along. You can hang them above your walls with different moldings and at different angles. You can pattern them in hearts arrangement or the tree of life photo display for easy ideas. If you’re looking for a more vintage decor, try using wooden frames with fresh wood colours. Use a scale to get accurate measurements between the photographs. If you are more of a circle person, take a long rectangle sheet of cardboard and make a ring. 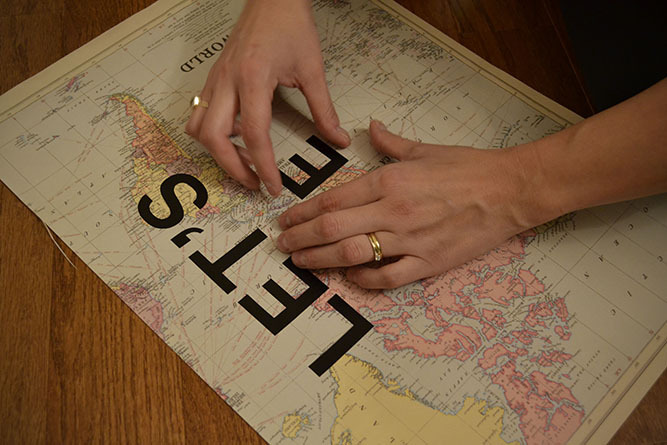 Cut your photos into a circle the same size to fit into your cardboard ring. Have you ever self-identified as a flower child? Ever adored a bouquet of blooms? Roses, lilies, jasmine and lavender – mere sight of them provides an aura of love and calmness. If you love splashes of vibrant colours – there’s plenty to suit your tastes like that classic look of daisies. Make a bunch of paper flowers suiting your lifestyle and attach them to your wall by a thread or just stick them to the wall. Stick to contrast by the colour of the wall in selecting the flowers. 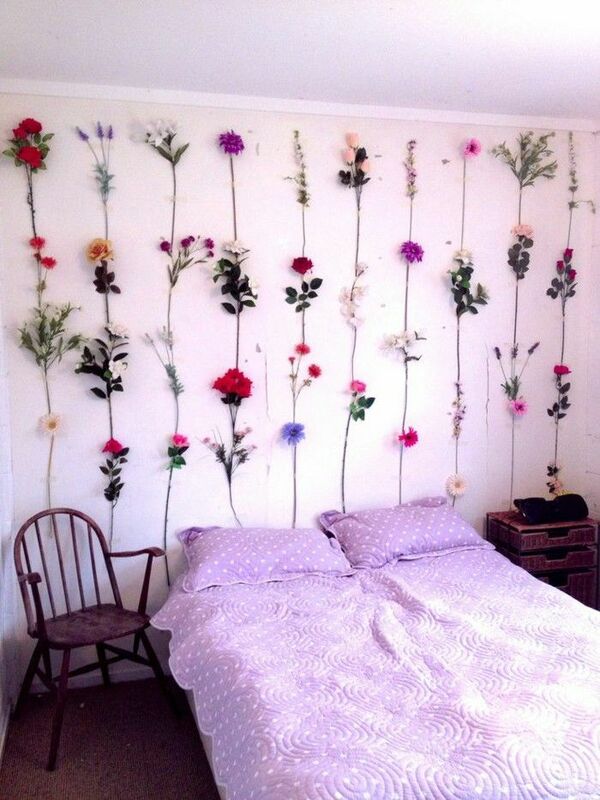 You can purchase flower stencils to add a soft essence to your bedroom – by stenciling on fabric wood or the wall itself. You can design and draw the branches on your own and usage of green plastic fencing to stick the flowers in denser proportions is highly recommended. Make sure you vary your flower placement, for a cute and immersed look. Left out places in between can be filled in with subtle green moss or paper cuts. Keep the stem and a pair of leaves for a mushier pop of green. Artsy crafts constituting yarns, crayons and repurposed materials can boost your creative attitude towards your wall decor. Simpler hanging dream-catchers can be made by use of air dry clay and spray paint on them. A strip of pixie lights, paper planes, boats can easily light up your bedroom. Yarn hangings and paper cutouts on white antique dinner plates prove contrast and simplicity in wall craft. You can furnish a miniature shelf to display any craft that accentuates your mind. 4. A wall full of inspiration! Shine bright like a diamond – There’s always that Topkick set of an inspirational quote that encourages you to hustle every day. You can either write it on a canvas adding a notch of your own thought. Or print the posters out and stick them. Many great “Word Apps” allows you to add text over photos. You can use them against solid colour backgrounds as well. Choose a quote, type it on your app and save to your phone’s photo album. You can easily make yourself a custom canvas of your own quote art! Find an old canvas and colour it with all sorts of colourful images from all the mags you have lying around. 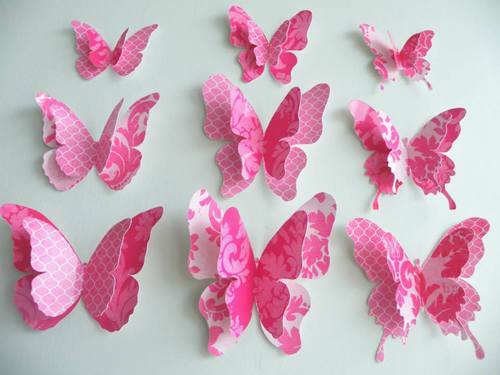 Just choose the brightest colours, and use some mod podge or spray adhesive to glue everything down. Choose some vinyl letters to spell out your special quote, and paint over the whole darn thing in your favourite colours. Or, are you one with tight schedule, hectic life and chaotic days and want to change the way your bedroom looks? Easily buy wall stickers, or vibrant wallpapers that describe your lifestyle and personality. There is a lot available online, and very budget-friendly too! This done, here is how to make your room look like a fairytale. This entry was posted in Create the Look and tagged bedroom, decor, Decor Ideas, wall, walldecor. I am a fierce combination of confusing contradictions that adds up to magical possibilities. 6 Amazing Ways To Light Up Your Room Using Fairy Lights!